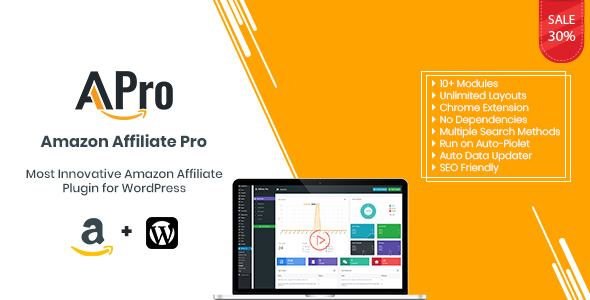 AAPro is the most innovative a unified suite of tools developed for Amazon Affiliate Program and WordPress. AAPro offers a variety of tools and a wealth of features you would not find anywhere else. It’s cheaper – infinitely more flexible and features rich. With AAPro, A 5-minute setup is all it takes to automate your affiliate website, from product importing – to data updating everything become super easy. Its automates up to 80% of work so that you can focus on only the human part. What can you do with AAPro? Direct Import –– Directly Import any Amazon Product from any region to your website with all its associated data and high-quality images. Auto Import –– You can even automate the product Importing function, in case you want to run it on auto piolet or you, are away from your desk. AAPro will keep on importing your desired products as per your given instructions. On-site Shopping Cart –– You can even allow your visitors to shop from Amazon directly on your website without leaving your website. With Remote shopping cart, your visitors can add any product to their Amazon shopping cart and can check out later at their convenience and you will earn commission, whenever they checkout within the next 90 days. API Control –– AAPro designed to make as much as fewer calls to Amazon API, which not only save your server resource but also keep your Amazon API Account under the safe hood. Amazon Customer Reviews –– You can show Amazon Real customer reviews on your website. Multiple Search Methods –– Like other plugins, you will not just get single Search Method, instead, you can search and find most suitable Amazon products in multiple ways. Search by ASIN, ISBN, Product Name, Seller Name, Brand Name, Browse Nodes etc… Search Single Product or Search Full Catalog, search with plugin or search using our chrome extension and Import them in multiple ways too, as per your choice. CSV Import –– You can Import or Schedule Products with a CSV formatted list of ASINs. Product Reviews –– You can even create stunning reviews of any product with beautiful reviews templates. Product Badges –– Unlike other plugins, you no need to label your products manually. AAPro automates it too. It will grant the most suitable product badge/label at the time of importing and also keeps it updating with the status change. Auto Data Updater –– AAPro also takes care of already imported product data, and keeps it syncing with Amazon servers at a given frequency on a regular interval. So you do not need to worry about stock and price change. Geo Targeting –– AAPro also allows you to target users as per their geographic location and serve them contents with their region. This will increase your chances of making extra commissions. Analytics –– AAPro tracks and note every user action on your Amazon affiliate website. You can check every data here, page views, referrals, checkouts, wishlists products etc. Amazon Affiliate Pro Plugin is bundled with its own theme, specially designed for the Amazon Affiliate Program. It’s flexible, responsive, fast and fully compatible with our plugin. SEO Friendly –– AAPro is completely SEO friendly and takes care of all basic SEO needs for any affiliate website. All required Schema Support is also included. Unlimited Layouts –– You can customize its appearance and layout as per your requirement and without any coding knowledge. Its super simple Setting and Home Page Designer panel allow you to customize any part of the theme. Fonts, Size, Colors, Grids, Section change anything you want in a few clicks of the mouse. Widget Support –– It comes with its own sidebar widgets and even more dynamic with WordPress Default widgets if needed. Shortcode Support –– However you will never require this with AAPro theme but we have added support for Shortcodes as well. Which you can use as per your needs. Multiple Methods to Display Products –– You can display products in multiple ways, show them as conventional product cards or in modern carousels, In sliders or as a Deal of The Day, show in list view or grid view choice is yours. Wishlist –– You can allow your visitors to create a wishlist and save products for later purchase/ reference. AAPro is loaded with the module system, which makes it super easy to enable or disable any feature, to save your server resource and simplify the process. Currently, Its have 10+ modules, which will make your life easier. What Items are Included with AAPro Suite? We have tried to make everything super simple, with things can be complicated in some cases, but no need to worry about, We are here 24×7 to listen to you. For any problem or query feel free to connect with us using your preferred method. Direct Support Using Plugin Help Form. All notable changes to the plugin and its theme will be documented here. WPKraft and AAPro are not affiliated with Amazon by any mean. To use this Plugin you will need to have Active Account with Amazon Product Advertising API in at least one region.